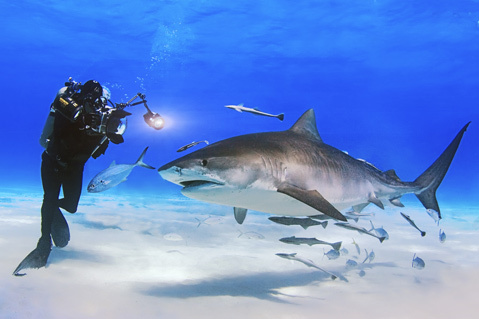 David Doubilet films a Tiger shark. No matter whom you blame, be it Jaws, Shark Week, or some other Hollywood twist of the facts, there is no denying that sharks have a bad reputation. For most of the world, the toothy apex ocean predator is either a stealthy demon or, worse, just a means to shark-fin soup. Either way, the view has left numerous shark species severely overfished and/or hunted to the brink of extinction. Enter famed National Geographic photographer David Doubilet and his wife, Jennifer Hayes. The duo, who is speaking at UCSB’s Campbell Hall this week thanks to the folks from Arts & Lectures, first met while documenting a shark birth several years ago and have been working to recast the sharks public image ever since. Doubilet, who is widely known for pioneering split-lens water photography, is National Geographic’s most published underwater photographer, a distinction that has afforded him ample time with sharks of all ilk. His assignments and projects have had his wife and him on a small inflatable alongside six tiger sharks devouring a large dead whale, as well as swimming peacefully alongside great whites. The pair will be the first to tell you that sharks of all kinds are ridiculously evolved, near-mystical animals that play a lynchpin role in any healthy underwater ecosystem. “It is a perfectly formed creature,” said Doubilet in a recent phone interview. “The way they are built, the way they move through the sea … their shape is hypnotic.” It’s obvious that he knows and feels these things deeply. And so their presentation this week, aptly titled Sharks: The Magnificent and Misunderstood Ghosts in Our Seas, promises to be a visually moving celebration of sharks done as true to nature as possible ― a recalibration of public opinion via a massive dose of crisp reality. “We are simply trying to show sharks in their own element,” said Hayes. David Doubilet and Jennifer Hayes will give their multimedia presentation on Saturday, March 21, 4 p.m., at UCSB’s Campbell Hall. For more information, call 893-3535 or see artsandlectures.ucsb.edu.